This is a see-through version of the moai that I've been working on. 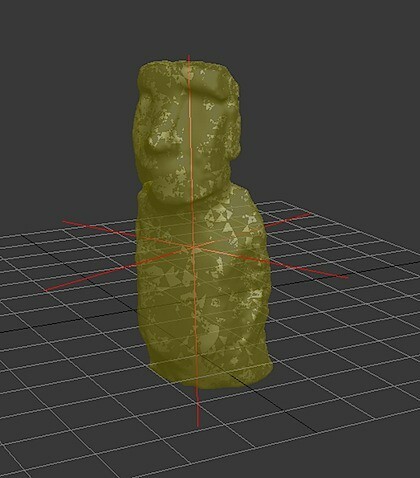 It is derived from a photosynth of a face-up fallen moai that is located along the south coast moai road (east of Charlie Love's excavation for those in the know). The redlines show the location of the center of mass. I'm now wondering whether the shape of the base has something to do the location of the center of mass and the general process of moving. Thinking about how tipping the statue to one side would make having a round front edge advantageous since the statue could effectively and smoothly "roll" along the front back and forth, minimizing friction, "rubbing" on the bottom, and making it easier to transfer the pendulum motion from one side to the other. Take a soda can, for example, and tilt it forward to a point before it tips over. If you rock the top of the can back and forth, the can will "roll" along its front edge and the shape of the travel will be along the shape of the curve of the bottom. Note that the front is the important part if the statues moves in that direction. Also note that the shape of the curve dictates how much of the statue makes contact with the ground at any point in time. The sharper the curve, the less surface area makes contact. The "flatter" the curve the greater the surface area. 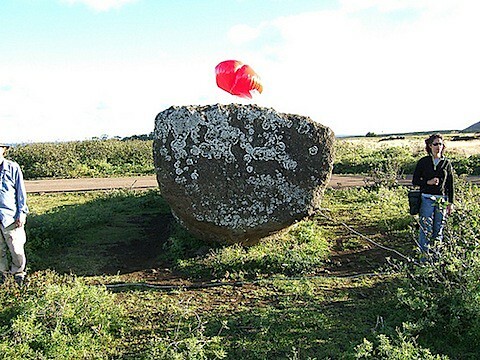 Consider this photo of the base of a moai from just outside of Rano Raraku. Matt and Deb are in the photo for scale positioned 5 meters from each other (as measured by the tape). It is a big statue. Here the shape of the base is circular towards the front one-half and more rectangular towards the back. The front curve is consistent with the "rolling" idea in the walking - small surface area during the rotation. The less curved sides also make sense since the greater length in contact with the ground means less pressure/surface area. This would avoid deadly pressure flakes that show up on "road moai" due to the gravity and the reflected force of the tilted statue on the welded tuff.